Carrying residential college flags and signs with statements like “Defend DACA – Keep families together” and “We stand with Dreamers,” Rice students, faculty and staff marched from Fondren Library to Rice Memorial Center’s Grand Hall the night of March 5 for a student-organized rally in support of the Deferred Action for Childhood Arrivals initiative. Sonia Torres speaks at the DACA rally in the Grand Hall. (Photo by Jeff Fitlow) To view more pictures from the event, scroll down to the photo gallery. Gibson emceed the event along with Lovett College senior Alberto Maldonado, former president of the Hispanic Association for Cultural Enrichment at Rice (HACER). She reminded the crowd that the Rice community affected by DACA includes not only graduate and undergraduate students and the faculty, but also staff members. The DACA initiative was introduced in 2012 by President Barack Obama to protect immigrants living in the country illegally who were brought to the U.S. when they were children. The program allows them to live and work in the United States and pursue a college education without the threat of deportation. Last September President Donald Trump announced the ending of the program. Rice President David Leebron was out of town, but he sent a statement that was read by Dean of Undergraduates John Hutchinson. 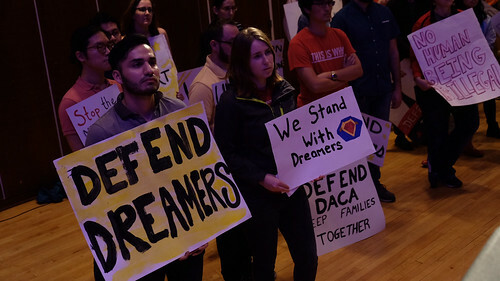 Leebron emphasized that all students are “a cherished part of our community” and that “we will always work to assure their ability to complete their studies and pursue their dreams.” He urged political representatives – especially those from Houston and Texas — to support an immediate extension of the DACA program. The remainder of the rally consisted of speeches and musical performances by students. Maldonado shared his family’s personal story. Describing himself as a “mixed-status 22-year-old,” Maldonado said his mother was pregnant with him when his parents came to the U.S. from Mexico 22 years ago. His sister, Leidy, was 3 at that time and became a DACA recipient. She obtained a Bachelor of Science degree from the University of North Texas in aviation logistics, but “she struggled to pay her way through college as she was considered an international student and was not qualified for federal financial aid,” he said, and she continued to struggle “to make her way to her dream job” with Southwest Airlines. “My sister is the epitome of the DACA recipient – high-achieving, determined and hindered,” he said. Other DACA recipients are missing “the chance to prove themselves,” he said. Gibson and Maldonado encouraged the rally supporters to visit tables set up in the Grand Hall for advocacy organizations like Mi Familia Vota and to take advantage of resources offered by groups like United We Dream and the Student Association’s Undocumented Student Support Services Task Force. The rally was originally planned to be held in the Academic Quad but was moved indoors due to rain in the forecast. Event organizers made the right decision — there was a downpour while the rally was underway.